Bushwick’s newest development, Denizen, is designed to provide residents with an integrated living experience where everything you could ever need (and want) can be found in one place. The building,located on the site of the former Rheingold Brewery, is slated to bring nearly 1000 units on one block. The site keeps the spirit of the old company alive with some of its’ engaging perks. It was also important for the architects and designers to be sensitive to the Bushwick community as this is a big change for the neighborhood. Living in Denizen promises to combine a lot of the best parts of being in Bushwick; a creative community, inspiring art and so many opportunities for entertainment and exploration. It’s so much more than a place for residents to come home to in the evening. There’s a community game room. 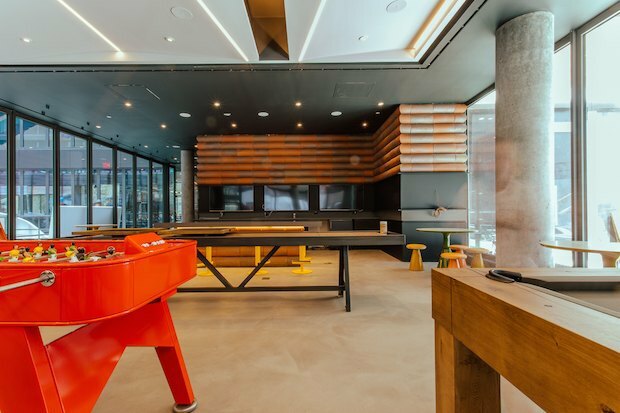 It’s filled with foosball tables, a billiards table, a full entertainment system and the fanciest Scrabble board ever. It’s huge, made out of wood and perfect for group games. There are also a slew of board games in the room. The game room opens up to the courtyard, which leads to the next perk… art. Denizen has a large wall of public art in the courtyard. The murals are viewable from all sides from within the courtyard. They come from a collaboration between Denizen and OPEN, an organization that aims to use art to engage with community members and artists. By the end of 2018, there will be 15 murals in total at both buildings on site, and by April of 2019, OPEN will also complete a sculpture project in the public park that’s nestled between both buildings. 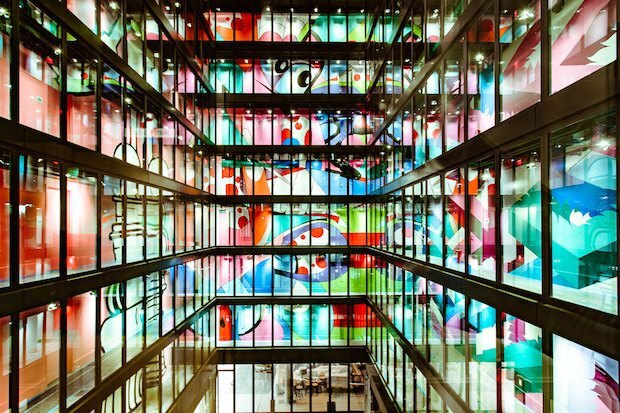 Apart from public art there is also an art gallery inside of the building. So many Bushwick residents love going on gallery crawls or attending art events, but at Denizen, the events will come to the residents. Creativity will be there regardless of cancelled plans or crazy weather. 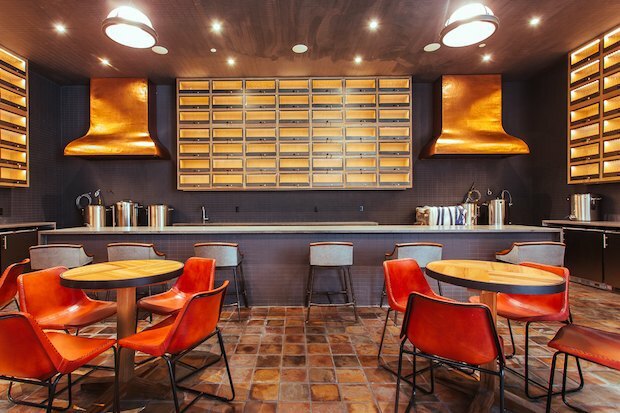 True to the site’s history, there is also a fully functional brewery at Denizen. Though it isn’t currently producing beer, it will be perfect for different local beer companies to come in and teach residents about the art of brewing. Any resident that isn’t a huge fan of beer will still get a chance to sample other drinks. 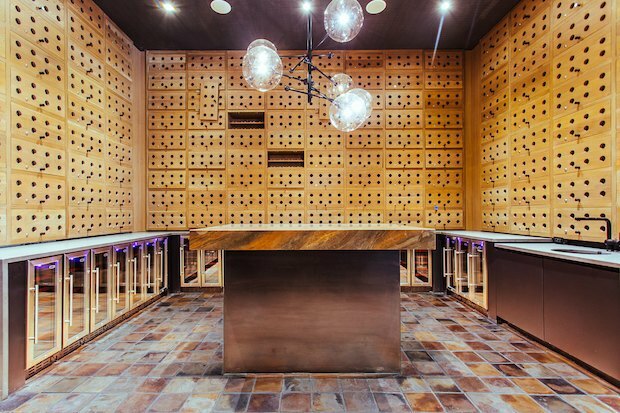 Denizen also has a wine tasting room complete with several walls of wine coolers. Local vendors can come in and have wines for everyone to sample at their leisure. Non-drinkers will still get to have great food in the building. There’s an urban farm that provides the building with fresh vegetables and herbs grown in a hydroponic system. 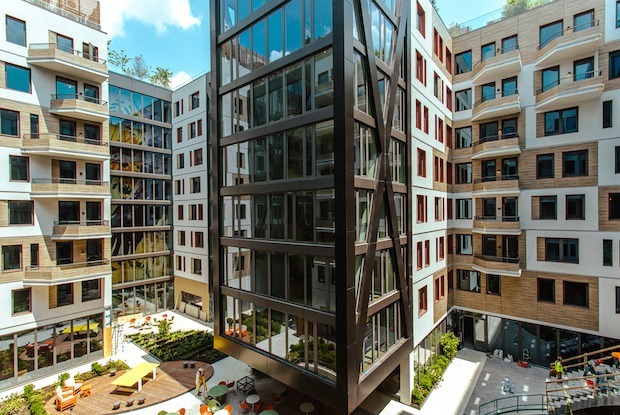 Denizen is also home to a chef’s kitchen that will be used in the future to host inventive chefs that could host events, or cater to residents for mealtimes. Denizen is a small city within a city, and it embodies everything that’s great about New York. Future residents can come be a part of the growing community that will strive to help them feel connected while maintaining the city convenience that’s so loved about being in Bushwick.